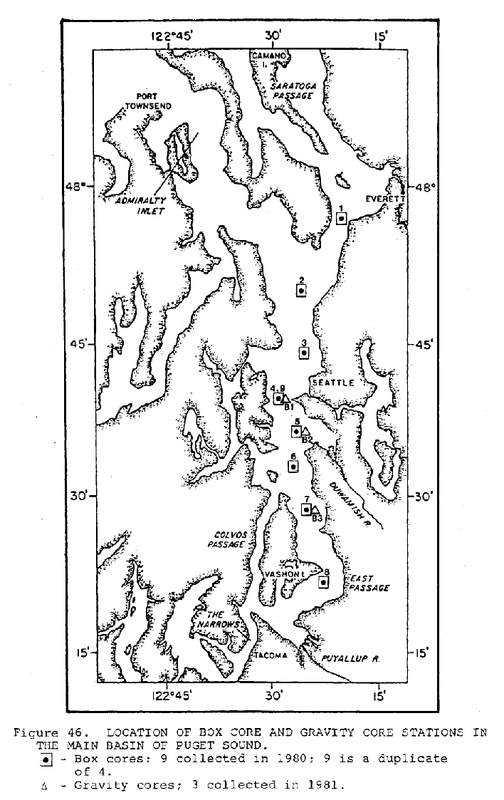 Toxicant pretreatment planning study technical report C1: Presence, distribution and fate of toxicants in Puget Sound and Lake Washington was published in October 1984. An important aspect in assessing the current and future quality of Puget Sound sediment is to determine how the present ambient concentrations compare with true background values before urbanization occurred in the region. In this study, the historic information was obtained by collecting a series of sediment cores from the deep central basin and analyzing sections of each core for metals and organic compounds. The deeper each section was in the core, the older the sediment it contained. The approximate time period that each section represents was determined by radioactive and stable lead dating techniques discussed in Appendix 4. By combining the information obtained from the box cores (50 em deep), gravity cores (140 em deep) and Kasten cores (250 em deep), a comparison could be made between concentrations during the pre-industrial/urbanization period and current ambient levels in surface sediments. Locations where these three type cores were collected are shown in Figures 46 and 47. Metal concentrations measured in the top and bottom segments of the nine box cores and three gravity cores analyzed in this study are listed in Table 26. The box cores showed only poorly defined, if any, differences between surface and buried sediments. The fairly uniform concentration in these 40-50 cm deep box cores is readily apparent from the sediment profiles shown in Figures 48 through 50. Only Mn showed a consistent change in trace metal concentration with depth in the sediment column; this change primarily reflects geochemical behavior (oxidation/reduction conditions) rather than temporal changes in input rates. The longer gravity cores, on the other hand, (Figures 51 thro-ugh 53) show core profiles that consistently have lower sediment concentrations at depth, which demonstrates that enrichment has occurred for these metals above their preindustrial baseline values. Another important trend apparent from the gravity core profiles is that, with the exception of Ag (at all sites sampled) and Hg (at the deep zone off urban Seattle), it appears that the levels of metals in sediments have decreased in recent years. Romberg, G. P., S. P. Pavlou, R. F. Shakes, W. Hom, E. A. Crecelius, P. Hamilton, J. T. Gunn, R. D. Muench, and J. Vinelli. 1984. Toxicant Pretreatment Planning Study Technical Report C1: Presence, Distribution and Fate of Toxicants in Puget Sound and Lake Washington. Metro Toxicant Program Report Nb. 6A, Water Quality Division. Prepared for Municipality of Metropolitan Seattle (Metro), Seattle, Washington. G. P. Romberg from Municipality of Metropolitan Seattle, S. P. Pavlou, R. F. Shokes, and W. Hom from JRB Associates, E. A. Crecelius from Battelle Marine Research Laboratory, P. Hamilton, J. T. Gunn, R. D. Muench and J. Vinelli from Science Applications, Inc.